As per usual, we arrived at the beach for the weekly kite club fly and the flag was glued around the flagpole. There was absolutely, positively no wind. No one even opened a kite bag. Speaking of kite bags, I got a new one this week. It’s a black MLD bag with red pockets. All my long kite bags are black with red pockets so I can readily identify my bags from my husband’s. Instead of flying, I decided to repack all my bags and do a kite inventory. At this writing, I have four bags done: Large Dragon Kites, Vintage Dual Line Stunt Kites, Dual Line Stunt Kites and Collector Single Line Kites. I have one bag left for Single Line Kites. Of course, I could not have gotten all this done alone. I had a helper. Though I’m not sure how much help Miss Kaylee actually provided. I thought I was doing pretty good and then I remembered the kite bag in the back of the truck. It is my traveling bag for the kites I take to the beach. At the moment, it is full. There are definitely more single line kites than will fit in one bag. Ohh, My!! And, now that I think about it, there are quite a few other bags that I also need to inventory. 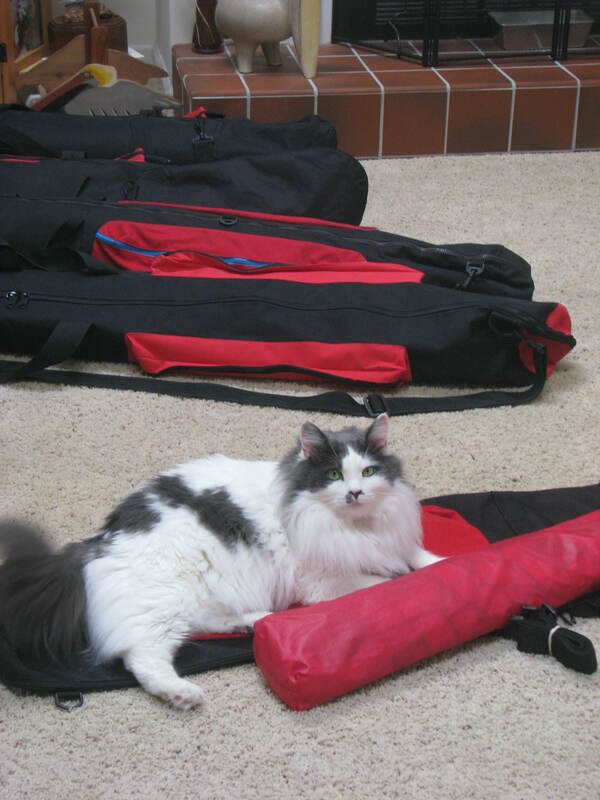 This includes a flat bag for hatas and dragon kites, a bag for Revolution and quad line stunt kites, a bag for the hyperkite stacks, a bag for the Trlbys, a bag of line laundry, a bag for ground display items and a bag of banners for festivals and events. I think I need to find a Kite Fliers Anonymous group to deal with this addiction. Fair Winds All. I know full well how you feel, I have too many bags that are single line display kites!! And then traction gear, feathers [dozens] line laundry, poles, stakes…….. is it addiction?? or affliction!!! Time to build out another trailer…..
Or another room on the house. 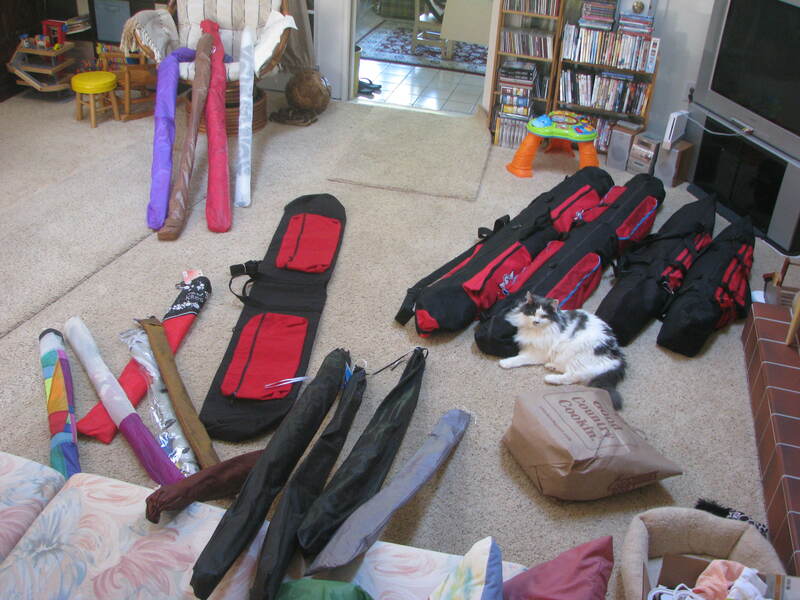 I’m storing the kites that I have made in a hard fishing rod case since I’ve run out of room in the kite bags. Definitely an addiction. Following your new blog and your Facebook page. I need to finish my latest kite projects and give a banner a try. Thanks for the links. « The Summer Season Has Arrived.